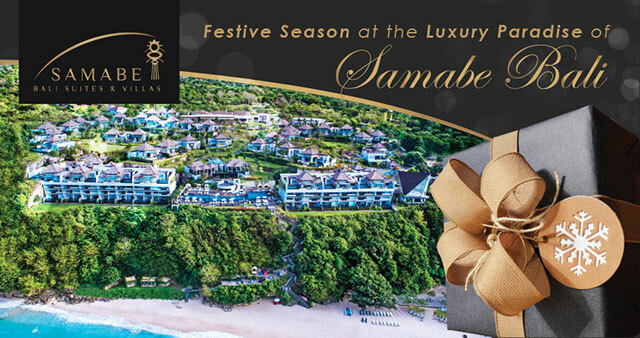 (Bali, December 2018) – The spirit of the festive season is here again, Samabe Bali Suites & Villas is celebrating a luxury holiday season and transform the resort into a buzzing favorite destination by the ocean. Promising to delight all the guests with an array of gastronomic prepared by the award-wining Rempah-Rempah Restaurant. Samabe Bali Suites & Villas has set everything into luxury and exclusivity, starting from the ultimate luxury suites or villa to the impressive celebratory dinner and performances. Rempah-Rempah Restaurant will be the only hotspot at the resort to celebrate your festive season starting from 24th, 25th, 27th, 29th, 30th and 31st December 2018. Bringing its vibrant and serenity atmosphere, Rempah-Rempah Restaurant offers different theme each day, such as Christmas Eve Candle Lit Dinner, Christmas Dinner Buffet, Denpasar Moon, Wok through Asia, East Meets West and the Celebratory New Year’s Eve Dinner. All the inspiring menu is specially crafted by the experience culinary team which will reveal an exciting flavors and take you to a gastronomic journey, from Bali to Western Countries. The other highlight of the season will be the Balinese Masquerade New Year’s Eve Party, when Samabe Bali Suites & Villas will be transformed into an exciting Masquerade party with all of our guests and the resort will be adorned with theme decoration and glamorous lighting. The celebration will be starting with the stunning performance of Devdan Show and take you to the Bali Nusa Dua Theatre. To count down the night into a new day of 2019, Rempah-Rempah Restaurant awaits you to come back and kick-off the night with series of stunning cuisines and performances. It is an ideal time to leave your hustle bustle of life behind and make the most of your day at Samabe Bali Suites & Villas as it’s taking the festive celebration beyond and above.